As readers of IFTLE might imagine, the recent headline "3M Claims new LED Lightbulb designed to burn for 25 years" caught my eye. The article went on to say that the bulb, which looks like a traditional incandescent, has a 25-year lifespan (at three hours of use per day) and a $25 price tag. 3M is betting the price won’t be a huge hurdle for consumers because competing LED bulbs "are priced closer to $45." They then repeated the infamous refrain: "LED light costs $1.63 per year to operate — a quarter of the cost of a traditional bulb. So even at $25, given its longevity, it still comes out where you save money over the life of the bulb." The bulb uses 3M’s multilayer optical film, adhesives, and heat-management technology. They indicate that their marketing has determined that "prospective buyers are likely to be environmentally conscious and more affluent — similar to those who bought a Toyota Prius hybrid in 2006." IFTLE certainly agrees 100% with the last statement. IFTLE has gone into great detail to show that it is the bulb that matters, not the expected life of the LED chip. If any of the components of the bulb are not rated for a 25-year lifetime the bulb should not be rated for this period of time. 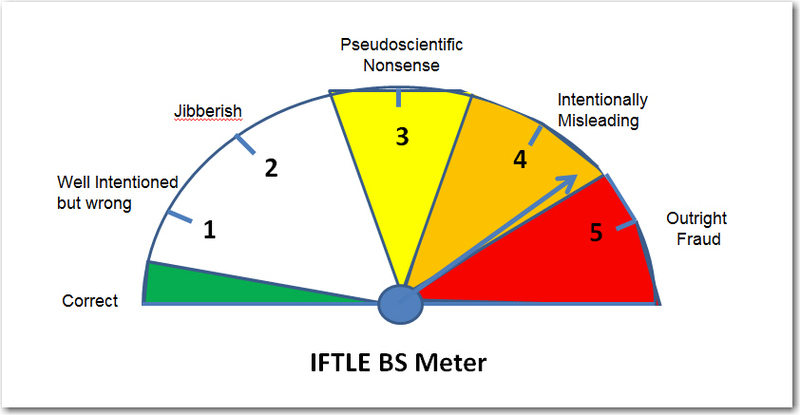 I checked the IFTLE BS meter for the merit of LED lightbulb ads and sure enough they rate just short of outright fraud. As I shook my head in disbelief that this scam of the American public was continuing unabated, with no corrective information coming from the DOE or any other Government agency [yes that was said tongue in cheek], I got a collect call from old friend Lester Lightbulb. As you know Lester is sitting on death row in San Quentin [isn't it fitting that California is the state that incarcerated him]. As he awaits the electric chair [pun intended] Lester reached out to admonish me for calling my recently failed CFL his "cousin" [see IFTLE 109: "2012 IEEE VLSI Conference ; Lester's cousin CFLDies Prematurely"]. While I had him on the phone I thought you, the readers of IFTLE, would appreciate a direct interview with Lester. IFTLE: Lester, of course we know that CFL and you are not related, we were just trying to link you, CFL and LED as part of the interior lighting family. Lester: I’d like to thank IFTLE and its like-minded readers for supporting me as I await eradication from the face of the earth, but that dirtbag "quicksilver" is no family member of mine. Do you see a tungsten filament? NO. So he is certainly not related to me. IFTLE: Quicksilver… is that his nickname? Lester: Yes, that’s what all us incandescents call him — quicksilver is mercury and all the CFLs contain that highly toxic element. They are the least environmentally friendly source of light that we can use, which makes it quite ironic that those who claim they are trying to save the environment are about to eradicate me and use him. I guess you haven’t seen the latest headlines from Sweden have you? IFTLE: No, please share them with us, Lester. Lester: "CFLs creating ‘acute crisis’ in Sweden." In a series of articles the Swedish newspaper Svenska Dagbladet has reported on the large scale ongoing dumping of fluorescent bulbs (CFLs), and the dangers of released mercury that goes with it [link]. Mina Gillberg, former advisor to EU environment commisioner Margot WallstrÃ¶m is now regretting the consequences of their decision to switch to CFLs. "The motive for replacing incandescent bulbs with CFLs was to save electricity and thereby save the environment," but Gillberg now condemns the drive for CFLs as "absurd." Sweden estimates that 200,000 CFLs are thrown into glass recycling bins per year. "‘This is a health risk for those who work with recycling and a risk that the environmental toxin spreads in the natural environment"…" Especially when the recycling bins are indoors, since mercury vaporizes at room temperature and contaminates the surrounding area." IFTLE: So mercury or quicksilver is really that big a problem, Lester? Lester: Mercury has long been recognized worldwide as a health hazard because its accumulation in the body can damage the nervous system, lungs, and kidneys, posing a particular threat to babies in the womb and young children. No one I have ever heard of, of any political persuasion, defends mercury. The British government instructs households that "…if a compact fluorescent lightbulb is broken in the home, the room should be cleared for 15 minutes because of the danger of inhaling mercury vapour." Similar warnings are on US packaging where, as we have already discussed, the consumer is directed to contact the EPA for proper disposal procedures. In 2009, timesonline [UK] reported extensively on the production of CFL in China, where "a heavy environmental price is being paid for the production of ‘green’ lightbulbs." Tests on hundreds of Chinese employees found dangerously high levels of mercury in their bodies and many have required hospital treatment, according to local health officials in the cities of Foshan and Guangzhou. At the Nanhai Feiyang lighting factory in Foshan tests found 68 out of 72 workers were so badly poisoned they required hospitalization. In Jinzhou, 121 out of 123 employees had excessive mercury levels." In 2008 Maine banned the disposal of CFL bulbs. In their tests CFLs were broken in a small/ moderate sized room and mercury concentrations in the room were continuously monitored. "Mercury concentration in the room air often exceeded the Maine Ambient Air Guideline of 300 ng/m3 for some period of time, with short excursions over 25,000 ng/m3, sometimes over 50,000 ng/m3, and possibly over 100,000 ng/m3 from the breakage of a single compact fluorescent lamp…. All types of flooring surfaces tested can retain mercury sources even when visibly clean….. Residual mercury in the carpeting has particular significance for children rolling around on a floor, babies crawling, or non mobile infants placed on the floor…. Vacuuming up the smaller debris particles in an un-vented room can elevate mercury concentrations over the MAAG in the room and it can linger at these levels for hours. And the vacuum can become contaminated by mercury such that it cannot be easily decontaminated." They indicated that the homeowner would have a decision on whether or not to "replace the carpet in the area where the bulb was broken." Is anyone who is buying a previously owned home thinking about whether the carpet has been contaminated with mercury? And what that means to their small children? So IFTLE, can you tell me why the world’s governments and the world’s self-described "environmentalists" are trying to eradicate the incandescant bulb and replace them with CFLs? IFTLE: Lester, I think it’s all tied to the EPA. In 1990, EPA was given authority to control mercury and other hazardous air pollutants from major sources of emissions to the air. For fossil fuel-fired power plants, the amendments required EPA to conduct a study of hazardous air pollutant emissions. In 1999, EPA estimated that approximately 75 tons of mercury were found in the coal delivered to power plants each year and about two-thirds of this mercury was emitted to the air annually. In 2000, the EPA found that regulation of hazardous air pollutants, including mercury, from coal and oil-fired power plants was appropriate and necessary. Lester, don’t you think that this is a good thing? You can’t be for supporting mercury pouring into the atmosphere from our electric utilities, can you? Lester: No, none of us are, but the electric utilities are taking steps to reduce mercury emissions from power plants as part of ongoing pollution prevention programs. In fact, existing control technologies for sulfur dioxide (SO2), nitrogen oxides (NOx), and particulate matter have reduced power plant mercury emissions by roughly 40 percent already. All of those nasty materials need to be scrubbed as does mercury, but notice I do not include CO2…and don’t get me started on that, because CO2 has gotten a worse bum rap than I have by the same ignorant environmentalists and corrupt scientists. IFTLE: SOX, NOX and particuate reductions are all good things, Lester. I’m with you on the C02 emissions too, Lester. CO2 rates a 5+ on my BS meter, but we shall discuss that scientific fraud another day. Lester: Anyway, my point is that instead of justifying toxic quicksilver light bulbs by pointing a finger at how toxic power generation is, why not continue to use safe, non-toxic, incandescent light bulbs and work on cleaning up the effluent from our power plants? Lester: The basic problem is that quicksilver bulb lifetime is impacted by how often the bulbs are turned on and off and their use temperature. Optimal use for a fluorescent light is to be left on all the time at temperatures between 50-80°F. Wikipedia indicates that "In the case of a 5-minute on/off cycle the lifespan of a CFL can be reduced to close to that of incandescent light bulbs" — which is exactly the result that you got! Since a lot of light use in the home is less than five minutes (i.e., a trip to the bathroom; looking in a closet; quick night time trip to the kitchen; get tool out of the garage, etc. ), a much more accurate statement for CFL packaging would be: "Lifetime is estimated at 250-10,000 hours depending on use." The picture below is of a CFL that failed after 200 hours [link]. 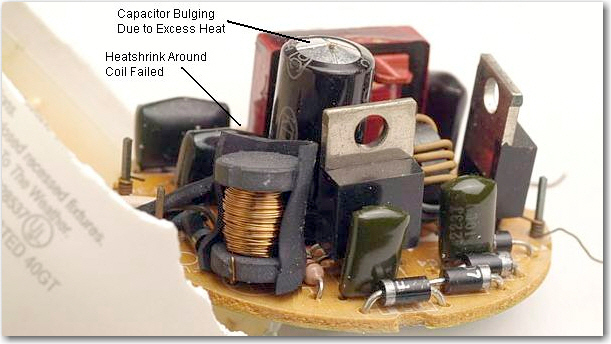 The electrolytic capacitor is bulging at the end, and it had ruptured its safety seal and leaked electrolyte; the heatshrink tubing around the inductor got so hot that it split; and the capacitors are all seriously discolored. The only way to get the maximum life from any CFL is to keep the electronics as cool as possible — preferably well under the manufacturers’ recommendation of 50°F. Homeowners will also be faced with the expensive requirement to replace all non-ventilated light fittings with new ones that have sufficient airflow to maintain a safe temperature for CFL use. Because such fittings must be installed by a licensed electrician (in most countries), this is another expense that is usually ignored. Any potential saving in energy bills is gone … for quite a few years, until the cost of the fittings and their installation is amortized. There is also the enormous waste of replacing perfectly good light fixtures with new ones, so the environmental impact is also negative — probably by a large margin. 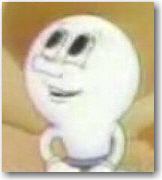 By the way, IFTLE, I saw that you threw your CFL bulb away with the garbage. Hope you won’t be doing that anymore after our little discussion on mercury! IFTLE: Wow, Lester, that’s a lot to think about. Anything else you want to share with our readers? Lester: Yes, I’d like them to read the 2009 NY Times "green blog" interview with Howard Brandston. He is the award-winning lighting designer who helped develop the nation’s first standards for energy-efficient building design. Mr. Brandston accuses "energy zealots" of using "faulty science" to determine the efficiency of light bulbs. To quote Mr Branston: "The calculations used by the government and others promulgating or promoting use of CFLs is strictly mathematical conjecture and has nothing to do with reality." When asked whether we shouldn’t be doing all we can to cut down the amount of power usage, he responded: "But hoping that lighting is going to make a major contribution [to the reduction of power usage] borders on ridiculous. The real areas that should be looked at that would make big gains are in all commercial office buildings. If they raised the temperature in the summer that they would cool to and lowered the temperature that they would heat to [...] we would save more energy in a few months than all the lighting watts per square foot baloney that’s going on now." IFTLE: Lester, as always it has been a pleasure. I sincerely hope we can turn things around and get you a pardon, for your good and the good of the country.